Up From the Ground Came a Bubblin' Spew: Sludge, that is. Dredging is one of the stickiest issues around the harbor. STACKED END TO END, the dozen candidates vying for two seats on the Santa Cruz Port District Commission would tower twice the height of the harbor's new lighthouse. That's a tidal wave of interest compared to the last election, when only two candidates--current incumbents Bill Geisreiter and Mark Nicklanovich--ran unopposed for this unpaid position that's supposedly dedicated to making the harbor a better place. What's weird is that typical harbor issues-- managing growth and overcrowded parking, maintaining facilities, and dealing with rotten-smelling sludge that results from dredging the harbor entrance--don't seem quite as controversial lately, perhaps inspiring an upsurge of aspiring civic leaders. In fact, most of the candidates don't seem to have much of an agenda at all. So, what gives down at the port? Turns out this large candidate pool is due to the flood of libertarians on the ballot. Michael Hanes, Lou Mata Jr., William Kingsley, Christopher Wellise, Bill Williams, Stephen Sibley and Tim Ruckle all identify as libertarians, and at least four say they are responding to a phone and letter campaign by the state Libertarian party to get more of its own on the ballot. "The Libertarian party called me up and asked me if I'd like to run for office," said Stephen Sibley. "I thought it would be something I could do and something I'd enjoy." "It's kind of a lark," said Tim Ruckle. "I didn't know much about it before I got a letter from them." Bill Anderson, treasurer of the Santa Cruz Libertarian party, admits there was a push to persuade libertarians to run for local offices. "All parties like to have people run for special district because it's a good introduction to how government works. Why they got so many people to say OK to the port district I have no idea, but they have no financial incentive," he says. And, apparently, the more the merrier, as far as the candidates are concerned. "Having seven people with this kind of libertarian bent brings a conversation that I think is very exciting to have," says libertarian candidate Micheal Hanes. The five port district commissioners are charged with administering activities at the harbor, which receives no tax funding and is run much like a business. The port district encompasses 30 square miles, including the city of Santa Cruz and unincorporated parts of the county, but excluding Capitola. All you need to do to get on the ballot for the Port District Commission is file a declaration of candidacy, but to place a statement in the voter information pamphlet costs $954, double if you want it in English and Spanish. Only three of the candidates appear in the pamphlet. Besides incumbents Geisreiter and Nicklanovich, few of the candidates appear to have significant experience with the harbor. Of these, attorney Mike Guth stands out as a community leader and the most involved at the grassroots level. "Community awareness raising is one of the biggest challenges to getting things done well," said Guth. "I personally thought it would be an excellent time to have an active community member on the port district to promote liaison." Guth is a director of Harbor to the Hook, a government watchdog and advocacy group for east side neighborhood and environmental issues, and a member of Live Oak Neighbors. He also speaks at the county supe meetings, where he is on good terms with Supervisor Jan Beautz, whose district includes the harbor. In fact, Guth says if Beautz were one day to retire and had no worthy contender stepping up to take her place, he might consider running. He also knows the harbor and its environs as a boater, fisherman and former championship body surfer. "I don't think any of them would go in the water unless they fell off their boat," Guth says of the current commissioners. "It's a different crowd." One could argue that the retired cadre of port district commissioners could use some fresh blood, especially considering that one of the commissioners, Joe Townsend, has held the post for 26 years and already has his own memorial at the harbor, the Joe Townsend Maritime Plaza. At 86 years old, he has been unable to attend a commission meeting for the last six months. His term expires in 2004. One candidate poised to contribute a charge of youthful vigor to the board is Billy Gloege, a 25-year-old real estate investment consultant and world-traveled sailor. And then there's Lou Mata Jr. an experienced waterman and harbor dweller, who says he wants to balance the interests of the harbor's neighbors, environmentalists, yachties, commercial fishermen, tourists and recreational boaters. "The same people that are on the board, they need to go," says Rachelle Denton, who lives next to the harbor and has to contend with the dredging that makes her house smell like a sewer. Dredging is the harbor's most foul dilemma. Fenton says the hydrogen sulfide fumes generated during the dredging process by dumping decomposing seaweed from the bottom of the harbor onto the beach give her headaches and watery eyes. Dredging proponents say the added sand "nourishes the beach," replacing sand otherwise disrupted by the harbor's breakwater from its normal flow down shore, and that the material is completely nontoxic and harmless. 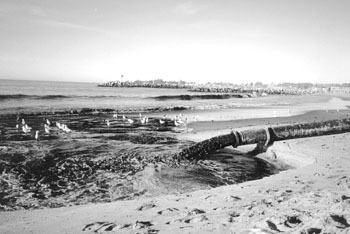 In winter, dredging happens four days a week, since the harbor contains no natural features that maintain its opening and is down-current from sediments flowing out of the San Lorenzo River. And though the dredging vessel is using a longer pipe this year to dump the sediments further offshore when odors are high, harbor director Brian Foss says no one has found a solution to dredging's unpleasant and unsightly side effects. While dredging is the issue that gets the constituents most passionate, Paul Cogswell, a marine mechanical technician, says he is running because he thinks the infrastructure is in a shambles. "It's obvious there's a problem down there, and a lot of people see it," he said. "All of the things that have been built are falling apart." However, the harbor is also in the process of putting the finishing touches on a new dry storage area for 140 boats, working on replacing worn-out concrete docks in the north harbor with synthetic docking and metal parts, and building a path out to the new lighthouse. The O'Neill building, which contains several offices, businesses, and restaurants, is also slated for a major remodel and retrofit to be completed in early 2004. Meanwhile, a Santa Cruz County Grand Jury report released this year lauded harbor commissioners and staff "for all that they have done to ensure that Santa Cruz Harbor is a beautiful recreation and vacation destination" and said the harbor "appears to be well-maintained."